Coffee is not just coffee anymore. You can choose beans, grounds, K-cups, creamer flavors, sizes, hot, iced, brands… you name it, it’s probably available. But when it comes to a coffee that offers benefits other than a caffeine boost, two options rise to the top. The sweet, creamy and nutritiously dense Keto Bomb™ creamer and the trendy, fat-rich, Bulletproof coffee. Here is a breakdown of the benefits of each and how to make them. Take a look and see how these two distinct cups of coffee stack up. Electrolytes: Help the body to maintain proper hydration levels. MCTs: These fatty acids are good fats that may support cognitive function and weight management. Essential fats: On a ketogenic diet, fats are 75% of your recommended daily caloric intake. This helps transition your body from using glucose (carbs) as energy to using ketones (fat) as energy, which supports weight loss. Bulletproof coffee is more nutritious than your average cup of joe. It is loaded with calories and healthy fats to match. Often used when fasting, Bulletproof coffee provides energy and can help you feel satiated. What is in Bulletproof Coffee? Bulletproof Coffee – These dark roast blends start at $14.99 for 12-ounce bags. Start by adding 2 ½ tablespoons of Bulletproof ground coffee to 8 ounces of boiling water and set it to brew. Then, add 1-2 tablespoons of Bulletproof Ghee and 1 serving of Brain Octane oil. Put it in an immersion blender until frothy and serve. 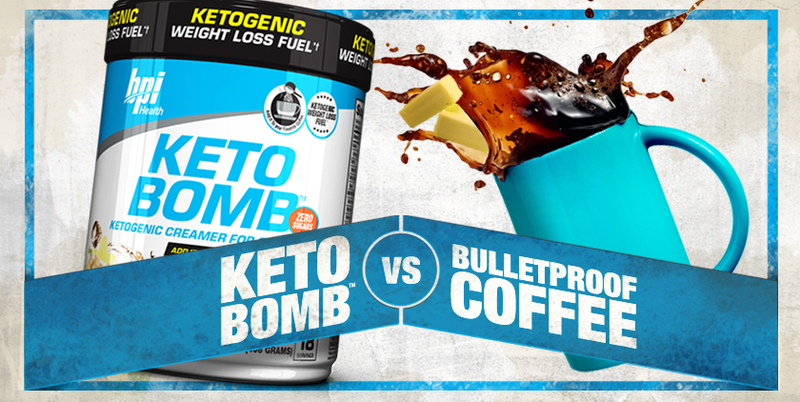 Keto Bomb™ and Bulletproof coffee both have their advantages. If you have plenty of time to play Barista, a Bulletproof coffee may be worth checking out. However, for all the benefits of Bulletproof with the addition of electrolytes and stir-and-go convenience, Keto Bomb™ reigns supreme. In our fast-paced world, the one scoop solution can turn a hectic morning into a delicious, nutritious and enjoyable daily routine.